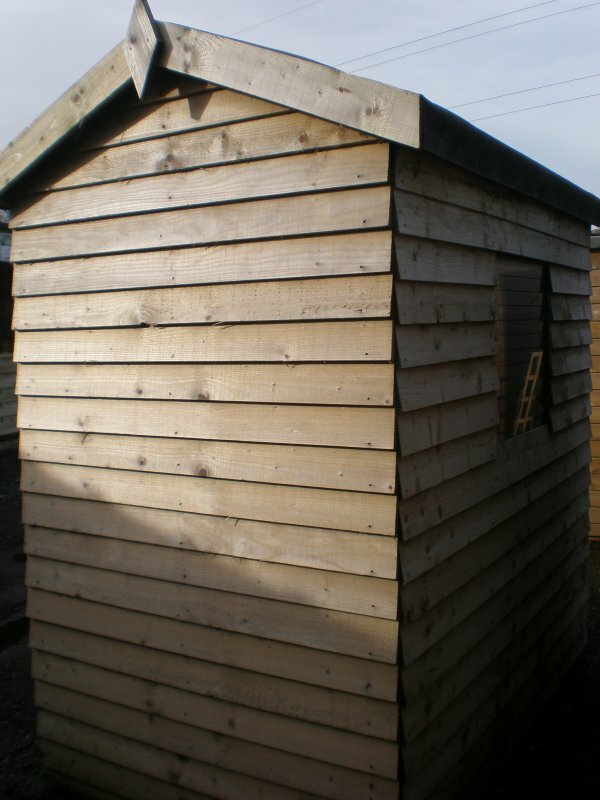 These sheds use predominantly UK grown timber, the featheredge is machined in England. After pressure treatment with preservative the shed components are assembled into wall sections. Also the framing timbers are pressure treated therefore increasing the service life of the shed. The walls are made from 2ex-22mm x 125mm featheredge cladding using 32mm x 50mm finished size timbers for framing. The door opening is 1.72m (5′ 8″) and the internal eaves height is 1.83m (6ft.) providing reasonable entrance access and standing room inside. The window opening is approx. 560mm wide x 480mm high and glazed with 3mm horticultural glass. 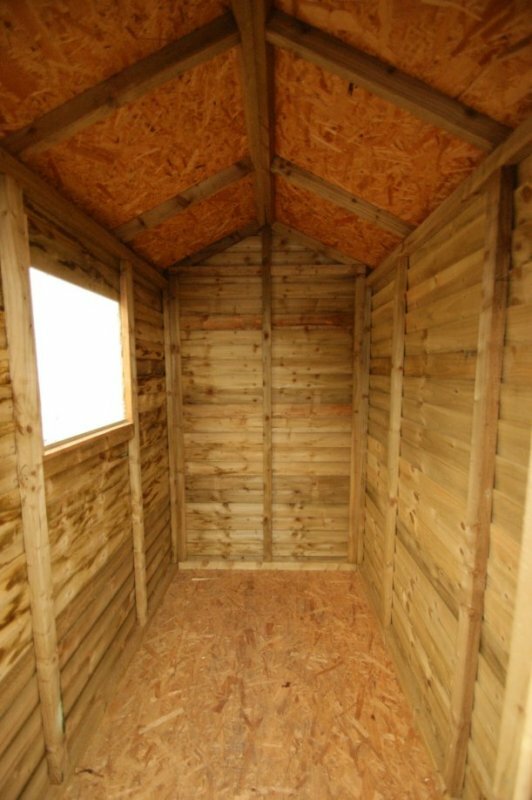 Both the shed floor and shed roof are made using 11mm OSB. The apex roof is then covered with 20Kg. roofing felt. Fixings are included and the door hinges and security bolt are both galvanised. 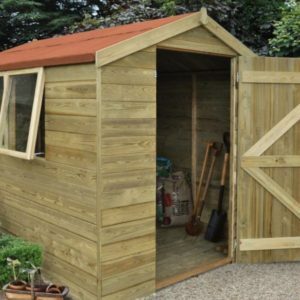 Devon Sheds have to put up with all sorts of extremes, but the pressure treated timbers help protect the timber against decay and fungal attack. This pressure treatment, Tanalith E, starts as a light green but changes to a light honey brown. Then after 18-24 months to a grey colour which is perfectly normal. From time to time we experience extreme weather. Because Tanalith treatment is water based it means that the shed timbers can become totally saturated. 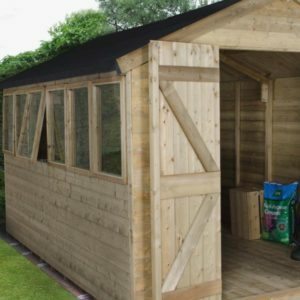 We strongly recommend that you treat your shed with a product such as Thompson’s Water Seal which is suitable for sawn timber and is rainproof in 1-2 hours. 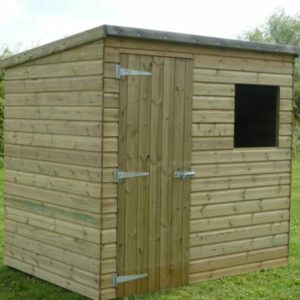 Our deliveries of sheds in Devon and Cornwall are made in sectional form, they are not ideally suited to a mechanical offload. Therefore with shed deliveries we require an able bodied person to be onsite to help the driver offload the sections of the shed which are bulky as well as being heavy. 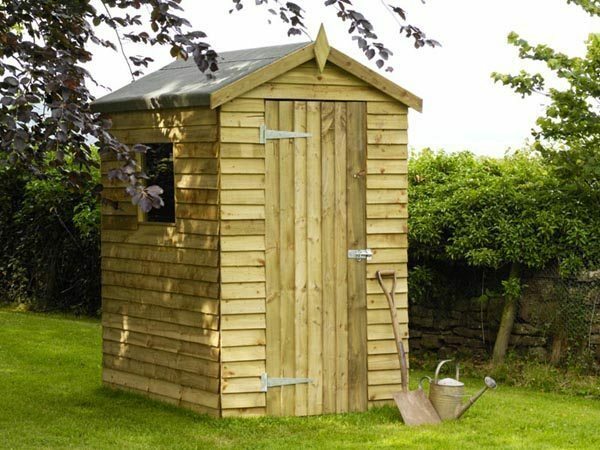 This featheredge shed should have a minimum clearance of 300mm (12”) all around to allow for shed assembly and for maintenance. 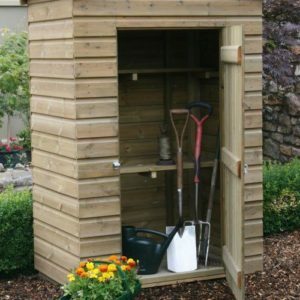 An earth base is suitable for this shed, but paving slabs or gravel would be better. The most important thing is that the site is self draining and that UC4 (user Class 4) pressure treated posts are used as bearers under the shed. Even tanalised structural timbers are not sufficient. Only UC4 (and above) timbers are treated for use in ground contact applications. Whenever possible we offer next day delivery. However during exceptionally busy periods* this may not always be possible. The anticipated delivery day will be advised when you are placing your order. We offer next day delivery when available for our normal delivery days (Monday to Friday) and normal delivery areas. Customers are requested to phone in before 12.00 pm on the day prior to delivery with their complete product listing, delivery address and payment details. Sometimes we have the flexibility to extend this cut off time depending on area, lorry weights and products required.